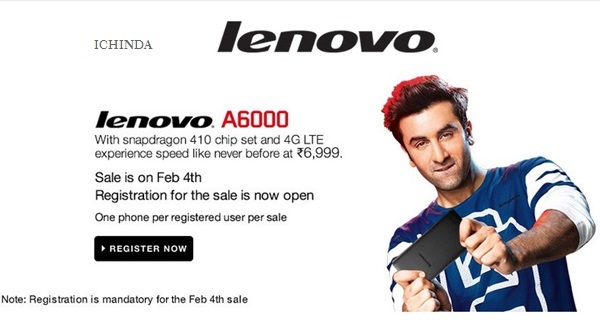 Looking for the best smartphone in affordable price than Chines smartphone maker, Lenovo brings you the world’s cheapest 4GLTE smartphone, Lenovo A6000 featuring fastest 64-bit processor, 5”-inch HD display, Android Kitkat and 8-MP rear Camera which launched in India on 16th Jan. 2015 priced at Rs 6,999. 10,000 units of Lenovo A6000 went on sale on 28th January, 2PM. through Flipkart and gone out of stock within 2 second. The next sale will begin on 4th Feb. 2014 and pre-registration is on. Lenovo A6000 4G(Rs 6,999) rivals are Xiaomi Redmi Note 4G(Rs 9,999), Micromax’s Yu Yureka(Rs 8,999) and upcoming Asus ZenFone 2 Mini. It has corning gorilla glass 3 which will protect your screen from being damaged ….